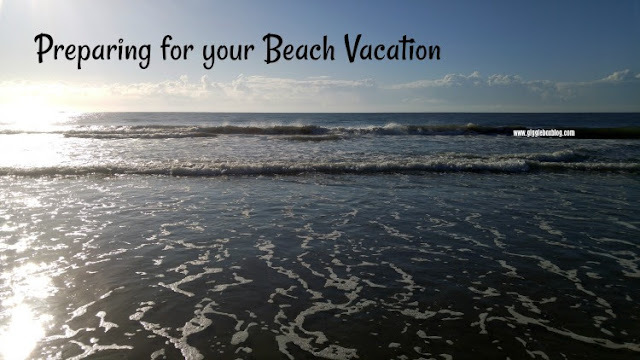 Beach vacations have always been our go to vacation when money is tight, but you just want to get away. I for one am not a lover of the beach. I just don't enjoy playing in the ocean or even in the sand. If I'm going to get burned, I'd much rather be having fun riding rides or doing something fun rather than sitting on the beach. With that being said, looks like I'm preparing for another beach vacation. Here's some tips that we've been learning over the past several years of going to the beach. Transporting beach items from room to beach - Before we would be like pack mules and carry all the items needed to enjoy some time out on the beach. 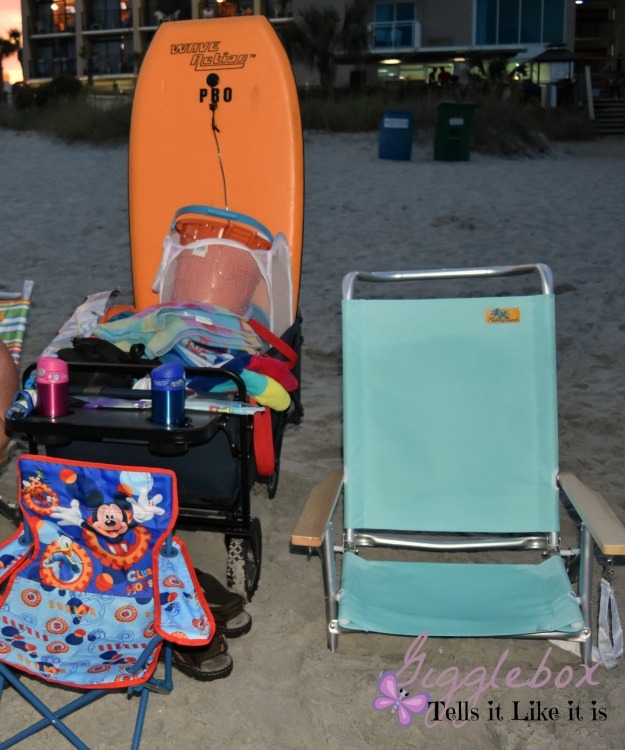 Last year, we purchased a folding wagon to help cart as much of our stuff as we could to the beach. Came in so handy and was a great way to just store the beach items in the room. Also loved the fact that there was a little table and bottle holder on one end - came in really handy. Beach setup - A must have for us is a beach umbrella and an umbrella anchor to help keep it in the sand. You could just stop there and put down a beach towel or you can get some beach chairs. Last year we decided to invest in a set of beach chairs which was nice. We also invested in some Thermos bottles which helps keep you hydrated and it keeps your drink cool for many hours. Highly recommend getting these bottles not just for a beach trip, but for everyday use. We also brought snacks down with us in case we had the munchies. Don't forget to bring the sunscreen and baby powder. You're probably thinking, "I get the sunscreen, but why baby powder?" Baby powder will help remove the sand from your body. 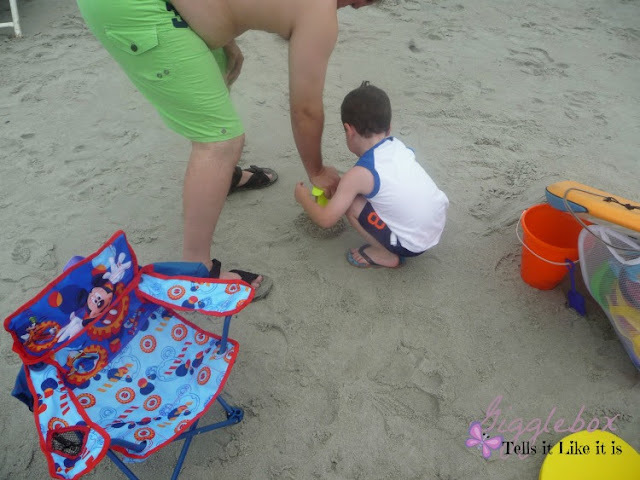 Sand toys - When I think of the beach and going with kids, I think of sand castles or at least trying to build sand castles. Well, you need sand toys to be able to do just that. Every year we seem to always have new shovels, buckets, and molds to add to our sand toy collection. 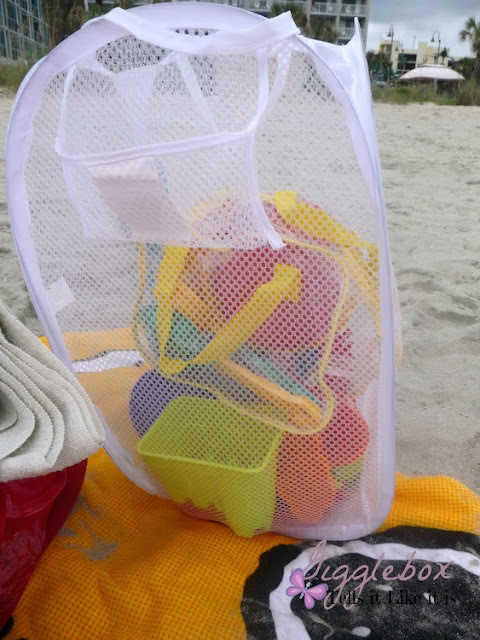 Here's a helpful tip that we've used the past couple trips, bring a mesh pop-up laundry hamper to put all the toys in after playing in the sand. Before leaving the sand, shake the hamper to help get as much of the sand off as possible. So helpful and nice to have all the toys in one container while on your vacation. Other beach entertainment - Last year, Michael actually decided to get in the ocean and use his kick board to surf the waves. Jon brought his body board so he could ride the waves when Michael was taking a break and playing in the sand. I brought magazines, but never got around to reading any of it. I ended up listening to some music on my cell phone and spent most of my time taking pictures of Jon and Michael playing in the ocean or sand. 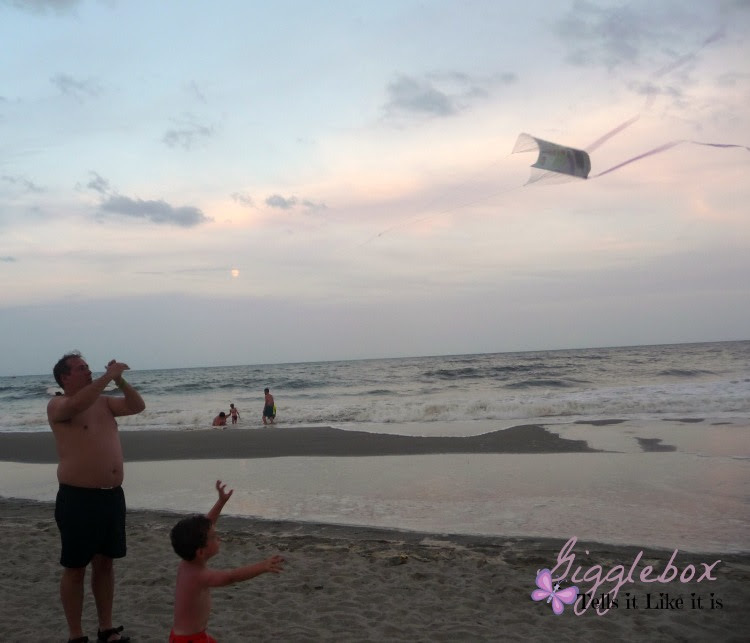 We also love to fly kites when we're at the beach. It's the perfect amount of wind and they just look so cool in the air with the beach as a background. Food - A couple of years ago I thought I was smart and bought most of the groceries we needed for our stay in Myrtle Beach here in Northern Virginia. You can read more about what all I bought for that trip and how much it ended up costing on my post, Meal Plan and Grocery Trip - Beach Edition. Last year I decided to save me all the work I went through in Packing for Myrtle Beach and not pre pack our lunches. We went to the Piggly Wiggly and got most of the items on our list, but unfortunately they didn't have everything. 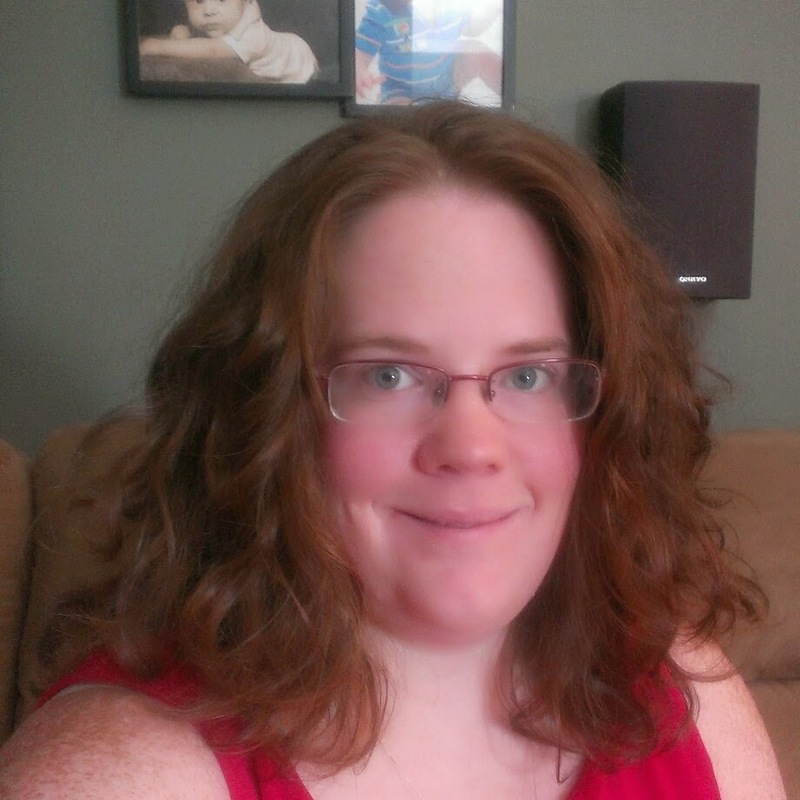 We ended up finding a Walmart Neighborhood Market which I would suggest going to over the Piggly Wiggly. We do grocery shopping in hopes to save money and not do much eating out. If you need some ideas of meals to make, you can read my post Meal Ideas for a Beach Vacation. If you're like me, you might also want to look into somethings that don't involve the ocean and beach. I always do a lot of research before any vacation to make a plan on the things we would like to see and do while down there. I'll be writing posts soon about all the other things we did over the past two trips so, stayed tuned for those. What would you add to this list?